CEO 956 is a Leyland PD2/40 with Park Royal H61R bodywork from 1958. She was built for Barrow In Furness Corporation (fleet number 169) and we see her parked on Middle Walk, Blackpool, on 29 September 1985. This is a date some of the readership will recognise, as being Blackpool’s Tramway Centenary day and she was taking part in a rally as part of the celebrations. What a handsome bus – helped by an attractive livery. Thank you, David. I’ve always thought the livery bore some affinity with the Birmingham one, likewise that of St Helens (only in red). 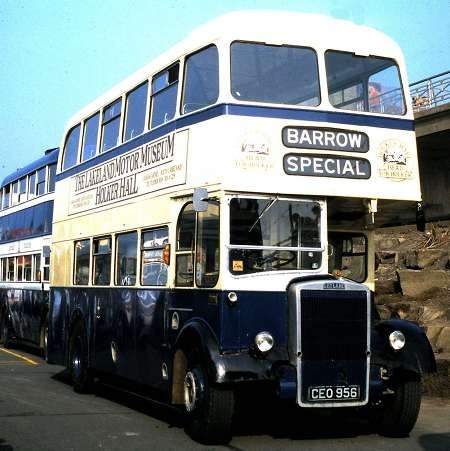 This vehicle along with No.170 (CEO 957), passed to the Furness Transport Group in the late 1970s, subsequently passing on to the Mersey and Calder Group. On Saturday 25th October 1986 it was hired back for one day by Barrow Corporation Transport and operated the final service journey (11pm Town Hall – Abbey Road – Harrel Lane – Washington – Town Hall), thus marking the end of 66 years of municipal transport in the Borough. Honourably bringing up the rear, behind this fabulous Barrow vehicle, is surely one of the splendid Lytham St Annes Leylands too. Those were the days indeed. There’s a name I’m glad to see here again – not Leyland or even Park Royal… or Barrow – but Youhill! Thank you so much Joe , that is very kind indeed. I have been through the mill to some tune this last couple of months but am now making the best of it – what else can one do ?? I am definitely not one of those to burden everyone else with my difficulties as this does neither party any good I always feel, so no morbid details here. Thank you once again though for your greatly appreciated concern – I have had many good wishes from various quarters and forums (fora I suppose for Latin aficionado’s) and these of course mean a lot. Correct, CY, and welcome back. The vehicle concerned is GTB 903. I feel the original is too close-up for submission for Peter to consider.